Tess Taylor opens her latest collection Work and Days with an assertion that “To miss even this springtime/ would be an error.” The poems in the book chronicle a year of working on a farm in Western Massachusetts, during the 2010-2011 growing season, shortly after the narrator’s miscarriage. The farm is partly an escape and partly a reconnection with a simple present – with cucumbers, frogs, and stones. Meanwhile, in the background, hover global warming, far-off wars, and social injustice. (Read the rest in Tinderbox Poetry Journal). 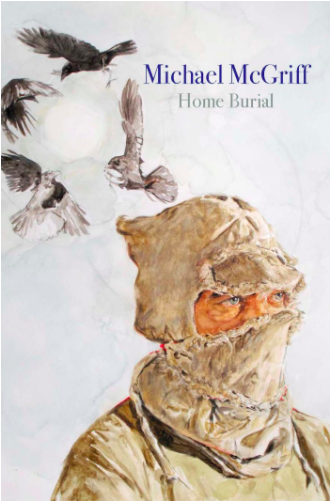 The poems in Michael McGriff’s Home Burial (Copper Canyon, 2012) inhabit a landscape of county roads, fence posts, rotting barns, and junked Studebakers, where the dead stay close, interposing themselves into constellations and muddy creeks. McGriff, who is the author of one other full-length collection and a chapbook, gives almost every thought an image rooted in rural Oregon. The image grows and culminates in the sound of a person tending to the candles in the floating hall. It’s the kind of leap Robert Bly described – or prescribed – in Leaping Poetry, where he claims that when forced to find the relationship between two very different images, we access unused parts of our brain. Bly’s neuroscience may have been off, but McGriff’s leaps are still intensely satisfying. at the far right of the painting. Elsewhere in the book, fog tumbles, light staggers and the night undresses. Everything in the landscape is alive, even though many of those who inhabit it are not. The long poems also offer another pleasure: while free verse is ostensibly free of structure, many contemporary free verse poems follow the same arc from image/story to epiphany. Read (or write) too many and it starts to feel like repeatedly listening to remixes of the same song. Instead, McGriff’s long poems follow an arc that is longer, more pained, and more expansive. We enter a land haunted by the dead, where “the night’s coarse tongue/scrapes your name/against the trees.” Here, a dying rural infrastructure has abandoned people, but land speaks to those same people in a way that is terrible and vital. for the moth-light of August . . . The man wears “the heavy jewels/of compliance/around his wrist,” and is a “denier/of barn dust,”– along with everything else that has rooted the other poems in the book. The bird’s job (and presumably the poet’s) is to continually tear itself away from this dislocated man and back toward the Oregon landscape, toward his original grief. [insert] Boy is Smith’s first full-length collection. The poems run the gambit from prose poems, free verse, and his own invented forms. One poem is a series of letters to the wife of the speaker’s white john. Towards the end of the book, a modified sestina form that stretches over eight parts. Firmly rooted in the body, many poems mix sexuality, violence, and religious language. Smith builds intensity through rhythm and repetition, as in “Craigslist Hook-Ups,” which begins “forgive me father, for I have called another man daddy.” Another poem, “Genesissy,” begins with the story of “the first snap, the hand’s humble attempt at thunder” and ends with the funeral of a genderqueer child told in a series of “begats”: “his aunt’s disgusted head shake/begat the world that killed/the not a boy-child.” “Genesissy” transforms from a prose poem to free verse that bursts across the page, to the block of the final six lines that tell us the annihilation of the child defies even God. Towards the end of the book Smith turns his attention toward transformative love between black men, which is always precarious given the line they inhabit between life and death. The narrator tells the beloved “Thank you for not fading to ash & memory.” The reprieve comes late and feels tenuous. Perhaps this is why in an interview Smith worried that he had “written about blackness too sadly.” There is a way in which writing about pain is actually celebrating its opposite, and Smith certainly pushes that line. In the same interview, Smith said “being black and gay is a gospel, an armor that I love dearly.” [insert] Boy feels like that gospel, an act of rescue in a world of violence and annihilation.